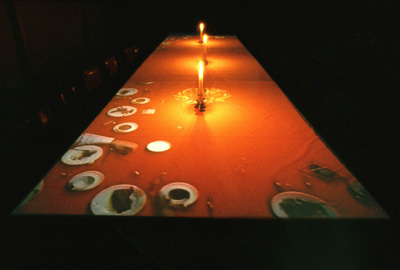 Table 600x150x75 cm, tablecloth, 3 chandeliers, 13 chairs, 13 audio-recordings through 13 pairs of earphones, 3 video-projectors, 3 videotapes (color, sound). The work consists of a table 160 x 600 x 75 cm in size, covered with a white tablecloth. Thirteen chairs are arranged along three sides of the table and three large chandeliers stand on the table.